Hello Malwarebytes 3.7 Beta community! 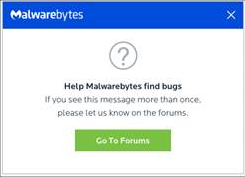 If you see the Malwarebytes message depicted below more than once, please let us know by responding to this forum topic. Thank you so very much to everyone who participates in our Beta programs. Your feedback is invaluable. Ran the download re booted and later still pops up the message. What's up? What is this pop up for. It would have been nice to be given some information. @LiquidTension will likely expand on Post #1. Until then, only so much can be discovered during Alpha testing by Quality Assurance and public Beta testing before release/RTM. For only those of you who likely saw the window twice or more appear, described and illustrated by the attached Portable Network Graphic (.png) image in Post #1, please follow the instructions in the hotlink and download & run the Malwarebytes Support Tool only in the passive "Gather Logs" mode and then attach the produced mbst-grab-results.zip archive in a reply to this topic. Your co-operation and understanding are always highly appreciated. I'm guessing we're supposed to upload it here, right? The "Help Fix Bugs" pop-up has come up up more than once on my home screen. This usually happens after I start my laptop first thing in the morning. Attache is the file created by the Malware support Tool. Same as above: Ran program , deleted and re-installed Malwarebytes. Still get pop up window. Please put someone on a fix to this aversion as soon as possible as it is starting to annoy quite a few of your customers. Hi there. Had the error message pop up once yesterday (2/8/2019) and once again today (2/9/2019). Logs attached as requested. Thanks! Thank you for reporting this. I will notify the Product team of this issue and will alert a member of the staff to respond here as soon as he is available, most likely on Monday if not sooner. I suspect there is a reason this is occurring that they saw coming as the alert contains instructions to inform them if the pop-up is displayed more than once so thank you for reporting this. @LiquidTension, can you please take a look? It appears this customer is seeing the beta/'help us fix bugs' notification/pop-up repeatedly. Here's mine.... just popped us when i logged in. Apologies that attachment went into the message. You need this I presume? I got the message pop up a few times. Here are the logs!